You Can Depend on Atlantic Coast Precast for Quality Precast Concrete Products! Since 1965, our team has produced Lauderdale by the Sea precast concrete scuppers for contractors, architects, engineers, and designers looking for a customized solution that will last through the years. Our precast scuppers, also called splash blocks or downspout splash guards protect homes, commercial buildings, and industrial facilities from damages caused by runoff rainwater. Call today for your FREE quote and benefit from decades of expert experience. Additional color options and designs are available. When ponding water erodes the soil around the base of your building, it could lead to expensive problems like water damages in basement ceilings, walls, and crawlspaces. In time, eroding soil could cause settlement in your supporting structures, destroying landscaping in the process. 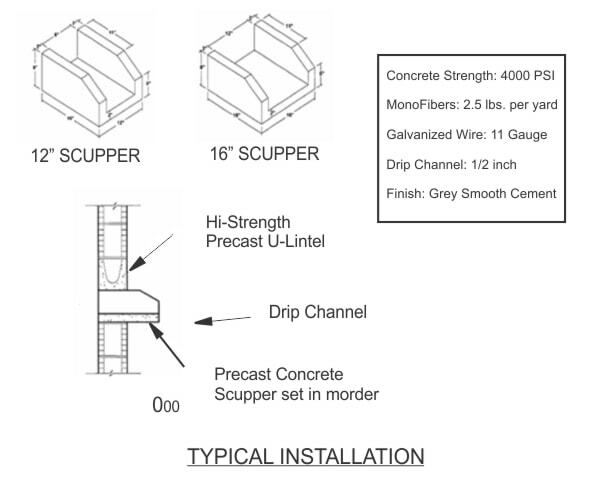 In Lauderdale by the Sea, precast concrete scuppers will carry water away from your building, preventing mud from splashing up against your walls in the process. Call Atlantic Coast Precast for custom made products in Lauderdale by the Sea precast concrete scuppers. Our precast scuppers control drainage when placed properly, and is an indispensable part of any rain gutter system in South Florida. We cast splash blocks and scuppers to your samples and specifications with our sustainable precast materials poured off-site. Call to begin designing your scuppers and learn more about our functional and decorational options. Scuppers are a cost effective product that allows water to exit from parapet walls on roofs as well as many other structures. We are happy to work with you to produce custom designed scuppers. Call us to speak to an expert today at 954.564.6245 to discuss your specific project needs.